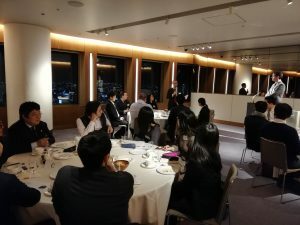 The 3rd NGRT of the 2018-2019 season was held on Wednesday, January 9 in Roppongi Hills Club, inviting Mr. Matthew Sussman, the Executive Director of the Japan-U.S. Educational Commission (Fulbright Japan) as a speaker. 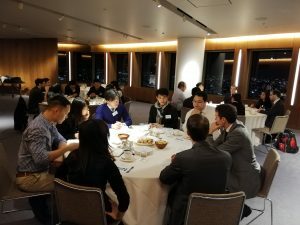 Having a main theme of “Thinking as a global leader”, hot discussions were held at each table. In the first half, discussions were made on elements necessary for influential global leaders. Participants shared the global leaders that they admire the most from various fields such as politics, religion, business, etc., and then considered the elements that each leader have in common. After sharing each table’s ideas, the discussion moved on to the 2nd topic “The biggest global issues to be solved, and how to solve those issues as a global leader”. The participants brought up problems that require certain time to solve such as education, healthcare, gender issues, and more. It became a great opportunity to rethink the importance of those long-term problems, and share ideas.